SLC: "Why A Kid?" art show! 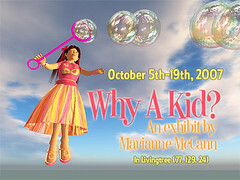 Livingtree island will be hosting a showing ofself-portraits by me, titled "Why A Kid? ", and focusing on the experiences of child avatars within the Second Life world. Show will run from the 5th of October to the 19th, with an opening event with me on the evening of the 6th at 8:00 p.m. SLT. If you or anyone you know has ever had a misconception about child avatars in Second Life, please come and learn some of the reality behind why people would choose to be a kid in this world! My works and a show book will be available at the show. All are welcome, an lotsa refreshments will be provided.